In my time networking here in Beaverton I have met a rather nice fellow who does law for the Hillsboro, Portland Beaverton area. He commissioned me to create a website for him and I thought it might be worth mentioning. Take a look at Ben Knaupp, the lawyer‘s website and if you have any law needs give him a call. He also has a video on foreclosure that you can check out. Tell him that Evan sent ya. 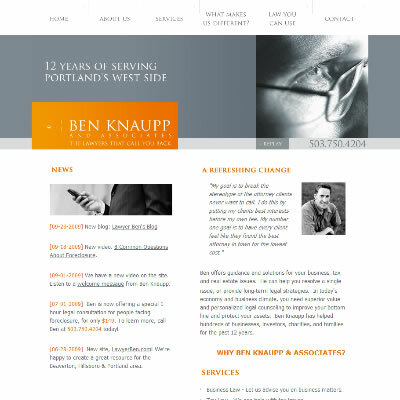 Update: Ben has since joined a prestigious law firm Garland, Griffith & Knaupp (lawyer Hillsboro). Next Post Next post: Savvy?